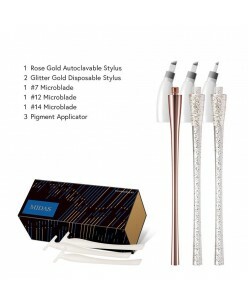 Goochie Microblading Master Kit Goochie holder; Goochie Microblading pigments >> Brow coffee, Dark coffee, Black coffee, Orange coffee; Microblading U blade needle x 10; Microblading B&G 12 prong needle (gold) x 10; Anesthetic "Blue Gel"; Anesthetic "Rejuvi Ge;"; Pencil; Practical skin; Cutas.. 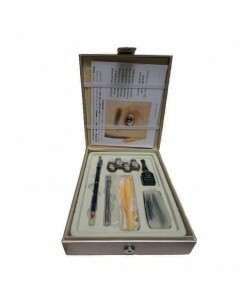 Skin Monarch microblading kit includes: 1 pcs. Bronxy eyebrow pigment 1 pcs. 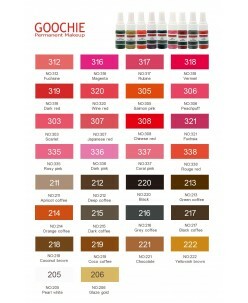 Jacobean eyebrow pigment 1 pcs. Olympo eyebrow pigment 1 pcs. 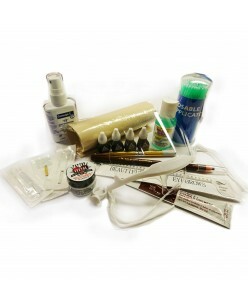 Skin Monarch universal holder 30 pcs. Skin Monarch Microblading needles 12CF 30 pcs. Skin Monarch Microblading needles 18U 1 pcs. &nbs..